With the launch of the Africa Continental Free Trade Area (AfCFTA) negotiations, the African Union (AU) has demonstrated commitment to the creation of a levelled playing field for food businesses and promoting consumer protection, animal health and welfare. These can be achieved through the implementation of Sanitary and Phytosanitary (SPS) programs in Africa in line with the World Trade Organization (WTO) SPS Agreement. The WTO SPS Agreement enjoins governments to base their SPS measures on international standards, guidelines, and recommendations developed by international standard setting organizations (FAO, WHO and Codex Alimentarius Commission (Codex). 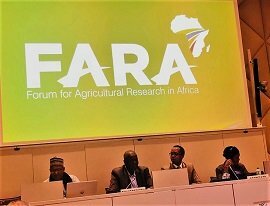 As the apex body for Agricultural Research in Africa and the technical arm of the African Union Commission on matters concerning Agricultural Research and Development, the Forum for Agricultural Research in Africa (FARA) called for stronger alignment to the Science Agenda for Agriculture (S3A) in implementing SPS programs in Africa. The call was made by the Executive Director of FARA, Dr. Yemi Akinbamijo, who was represented by Dr. Abdulrazak Ibrahim, Capacity Development Officer at FARA, during a consultative meeting of the Africa Continental SPS Committee on 20th March 2019 in Geneva, Switzerland. The SPS Committee guides the coordination and implementation of SPS matters at the continental level with the task of promoting and mainstreaming of SPS issues (food safety, plant and animal health) into the implementation of the Comprehensive Africa Agricultural Development Program (CAADP) and other agriculture, trade-related, health and environmental initiatives and frameworks. Sharing FARA’s experience at the meeting, Dr. Ibrahim, indicated that in practical terms, mainstreaming SPS into CAADP further underscores the need for deepening the application of science in Africa’s agricultural landscape. This is encapsulated in the 4th pillar of the S3A, which deals with responses to mega trends and challenges for agriculture in Africa and in the cross-cutting area of foresight. FARA called upon the committee to take advantage of the forth-coming 8th African Agriculture Science Week (AASW8) and the FARA General Assembly (GA), scheduled to take place between 28th October -1st November 2019 in Cairo Egypt. Briefing Prof. Ahmed El-Sawalhy, Head of AU Inter-African Phytosanitary Council and Prof. Abd El-Fatta Mabrouk Amer, Senior Scientific Secretary, Entomology in the AU Inter-African Phytosanitary Council, Dr Ibrahim made the case for stronger collaboration with FARA in taking the discussion and foresight analysis on new threats to African agro-ecological space, including the threat posed by Xylella fastidiosa, a notch higher. As countries are preparing to develop tailor made investment proposals for the implementation of S3A, the endorsement of AfCFTA would require strong technical framework as represented by the S3A to effectively mainstream SPS measures in developing their National Agricultural Investment Plans (NAIP). FARA expressed commitment in providing the technical support and creating the science-policy nexus necessary for informed decision making, to allow for coherent and harmonized SPS strategy in tandem with the AfCFTA.